Artificial intelligence - the last invention of humankind? In an interactive exhibition and series of events, ETH Zurich takes you on a journey through the brain, "RETHINKING INTELLIGENCE". In Davos for the WEF Annual Meeting? From world leaders to the next generation of digital natives and from robotics experts to neuroscientists, ETH Zurich invites the world to come out to play during the World Economic Forum Annual Meeting 2018 in Davos, Switzerland. The ETH Zurich Pavilion becomes an experimental lab of interactive exhibits delving into the inner-workings of the brain and tantalizing the taste buds in its TasteLab café. ETH Zurich - ranked among the top ten universities in the world - hosts a pre-Annual Meeting interactive discussion on the topic, "RETHINKING INTELLIGENCE". While future applications of machine learning demonstrate potentially impressive capabilities, they have also sparked deep controversy. "How do we code to ensure a sustainable future while avoiding self-destruction?" As a member of the international and Swiss press, we invite you to join this event for an inside scoop on "superintelligence." Your presence ensures access to top leaders and researchers from Google Research Europe, IBM Research Zurich, Disney Research, Starmind, Silicon Valley Robotics, and ETH Zurich robotics and AI experts.John Fraher, Bloomberg News, will moderate an interactive discussion that explores the risks and potential of AI - possibly the last invention of humankind. Even if you are unable to join us in Davos, we invite you to write about some of the robotics and neuroscience demos that will inspire future applications in AI. We provide you with advance access to the multi-media packages for the project demos included in ETH Zurich's public exhibition. Here are just two examples, much more to be revealed. 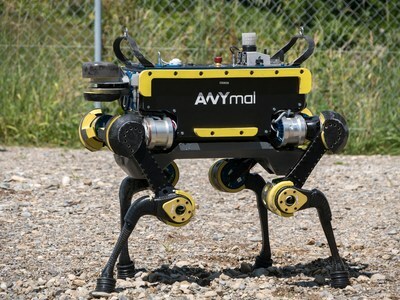 A quadrupedal robotic dog, ANYmal is an autonomous search and rescue robot that can map its environment and navigate its own path. ETH Zurich's Robotic Systems Lab designed ANYmal to operate in challenging environments such as industrial inspection of oil and gas sites. Challenge Dextra to a timeless game of Rock-Paper-Scissors, but do not be disappointed if she seems to anticipate your every move. 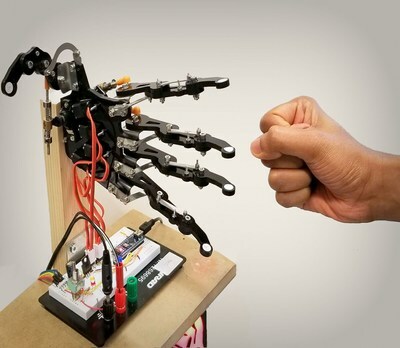 This robotic hand uses a brain-inspired neural network and camera to recognize your hand gestures and anticipate your every move. "Despite the extensive robotics research effort in the last few decades, robots are still not "intelligent." They do not have real tactile interaction capabilities and still require highly skilled people to program even the simplest tasks." Roland Siegwart, Head of ETH Zurich's Autonomous Systems Lab. "Creators of intelligent systems currently follow two distinct paths. The first aims to realize brain-like computation by re-engineering the exact properties of neurons and the networks within the brain. The second approach aims to understand the high-level neural algorithms that the brain uses for computation and to replicate it in computer hardware. It is not yet clear which approach will win the race." Benjamin Grewe, ETH Zurich Assistant Professor of Neuroinformatics and Neuronal Systems.